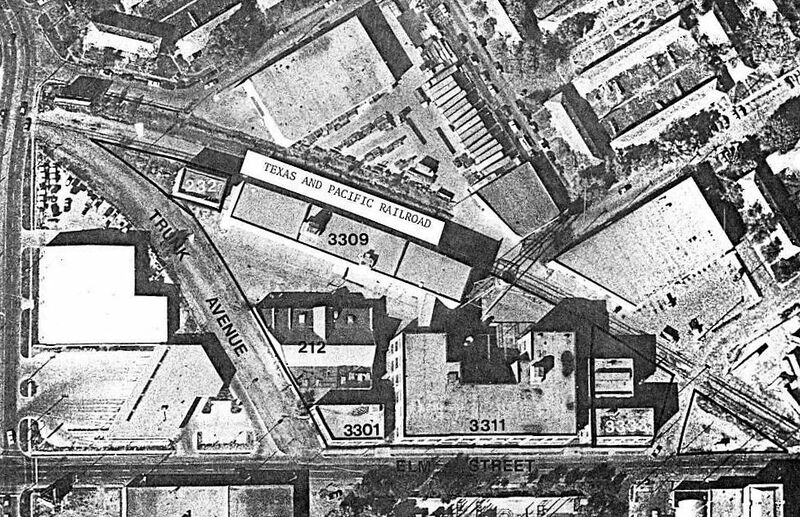 The Continental Gin Co. complex of buildings at Elm and Trunk is a Deep Ellum fixture which was successfully petitioned by the city in 1983 to be added to the National Register of Historic Places. No longer a manufacturing hub, it is now home to artists’ studios and residential lofts. The earliest of the buildings still standing were built in 1888 and the latest ones (the ones closer to Elm) were built in 1914. 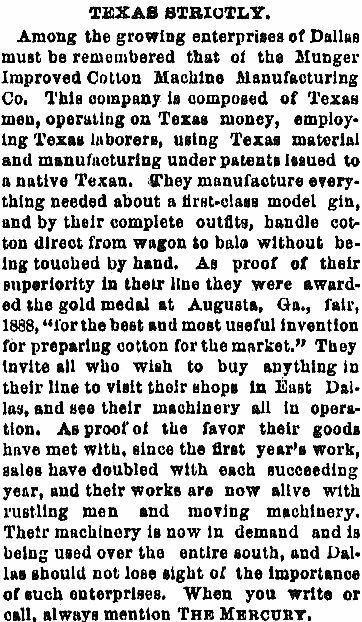 The company was incredibly successful, which was no surprise when one realizes that fully ONE-SIXTH of the world’s cotton grew within a 150-mile radius of Dallas at the time! 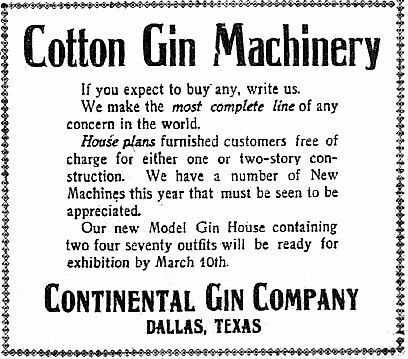 It’s no wonder that Dallas was a hotbed of cotton gin manufacturing. 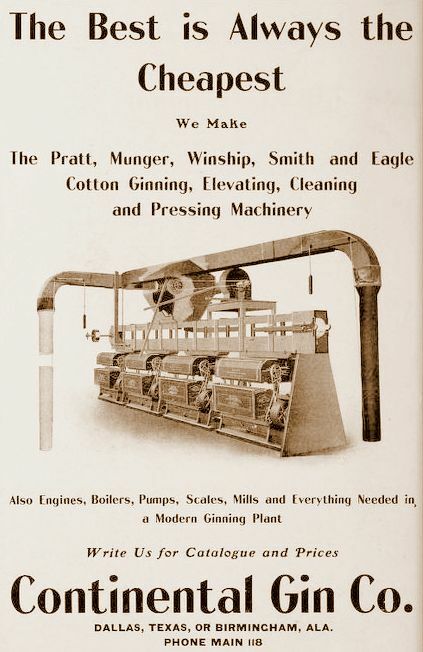 Robert S. Munger (yes, that Munger) patented several inventions that improved the cotton ginning process, and in 1888 he built a large manufacturing plant for his Munger Improved Cotton Machine Company. 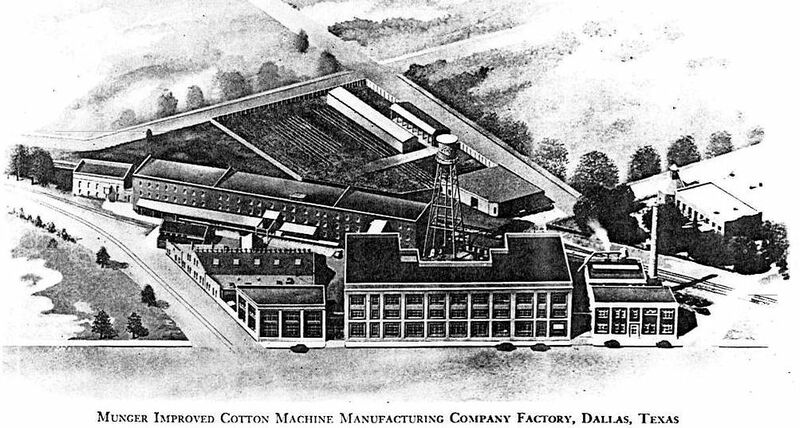 In 1900, after several extremely successful years, his company and several other companies that held important industry patents were absorbed by the Continental Gin Co. of Birmingham, Alabama, and, practically overnight, the Continental Gin Co. became the largest manufacturer of cotton gins in the United States. Munger retained a financial interest in the company, but he left the running of the business to his brother, S.I. Munger. R.S. Munger turned his creative talents to real estate and developed the exclusive Munger Place neighborhood. The Continental Gin Co. closed in 1962. A few newspaper items regarding the Munger Improved Cotton Machine Company and the Continental Gin Company. Handbook of Texas biography of Robert Sylvester Munger (1854-1923) is here. The top image (which, by the way, took me FOREVER to find, is labeled as the Munger company, but the expansion would seem to indicate that this is the Continental Gin Company, after 1914. Whatever the case, it’s a great image! That image and the aerial photograph of 1980 are included in the city’s application to have the complex included in the National Register of Historic Places, submitted in 1983. The detailed application — as a Texas Historical Commission PDF — can be accessed here. 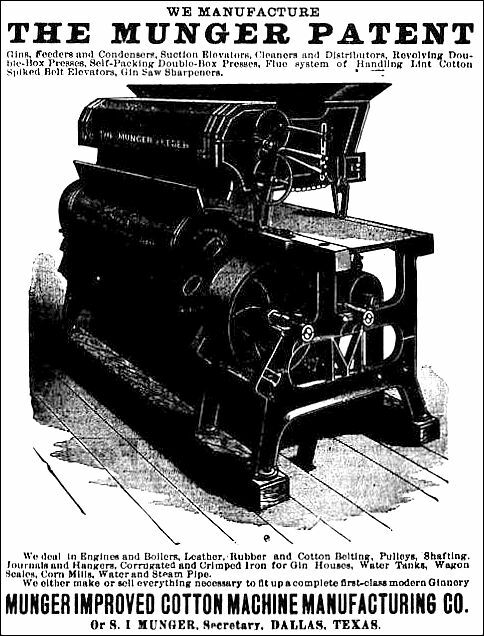 The second image, of the early days of the Munger Improved Cotton Machine Company is from a bookseller’s online listing for Munger’s 13th Annual Catalogue and Price List (1895) — the item may still be available for a mere $435 and can be found here. See an aerial view of what the area looks like today, via Google, here. To see an incredible 1914 photograph of the buildings and the residential area to the north, see my post “The Continental Gin Complex — 1914,” here. More on Robert S. Munger and more early company ads can be found in the post “R. S. Munger’s Cotton Gin Manufactory,” here. Very cool! Thanks so much for what you do. Thanks, Emily! And thank YOU for reading! Thank you for your information and research on the Munger Gin Co.etc. My great grandfather worked as a carpenter there in 1889 &1890 and was a night watchmanin 1893/94 after he was injured and recuperating from his injury. I wonder if he met whoever hired him in Mexia where his brother lived. My grandfather was born in Dallas in 1893. I really enjoyed the ads and photographs they are great.